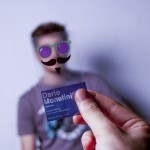 Promotional Products: What Happened to That Free T-Shirt? Fabrek Cards work by rubbing the fabric side across the screen. According to a study last year by the Advertising Specialty Institute (ASI), promotional products provided an advertiser recall rate of 82 percent among promotional product recipients in every international city surveyed. ASI’s Global Advertising Specialties Impressions study also concluded that promotional products have a lower or similar cost per impression (CPI) than many traditional advertising mediums, including the Internet. The top two most popular promotional products, according to the study, were writing instruments and shirts. Surprisingly, these two items were at the bottom of the list when it came to the number of months they were kept by study respondents. If you buy or sell promotional products, you are undoubtedly looking to leverage products that are affordable, portable, promotional, and that people will utilize both at work and at home, becoming a part of their everyday life. You want to minimize CPI by maximizing product interaction and the number of months items are kept. 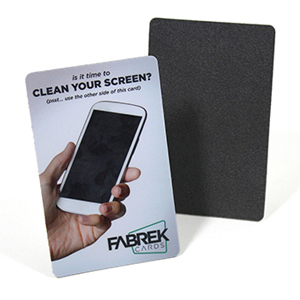 A screen cleaner card, such as the Fabrek Card™ by Plastek Cards may help you accomplish this objective. Fabrek Cards clean any type of phone, tablet or computer screen without introducing liquid into the process, making them safer for use with electronics. Fabrek Cards fit easily into a wallet, are durable and, since the promotional side faces the user with each use, Fabrek Cards provide an exceptional advertising medium.